Toronto's fifth annual festival featuring the thrilling sound of the pipe organ, "The King of Instruments". All the details are here on our website. Just scroll down for a list of all our 2010 concerts. For a printable brochure, click on the link below. See you at ORGANIX 10. Monday, May 3, 12:15-1:00 p.m.
Rheinberger’s Suite for organ, violin and cello, Op. 149 is the main work on the opening concert of ORGANIX 10. Tickets:$20 in advance and $21 at the door. The castle’s Wurlitzer theatre organ will sing in Ross’s capable hands, featuring an entertaining program of pops favourites. Friday, May 7, 7:30 p.m.
A dazzling program on Canada’s largest pipe organ performed by the winner of the 2008 Canadian International Organ Competition held in Montreal. Monday, May 10, 12:15-1:00 p.m.
Monday, May 17, 12:15-1:00 p.m.
A program of delightful music for organ and strings by Corrette and Mozart plus organ and orchestra solos. 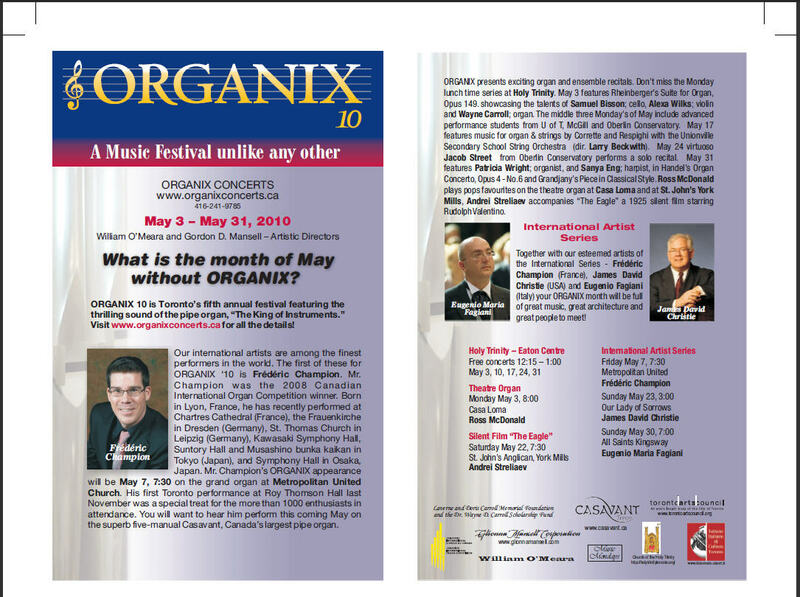 Every year ORGANIX presents concerts by advanced organ students from nearby universities. Today’s concert features Rachel Mahon from the University of Toronto. Saturday, May 22, 7:30 p.m.
Andrei improvises his original accompaniment to the 1925 silent film “The Eagle” starring 1920’s romantic hero Rudolf Valentino. Experience what it was like to go to a movie before recorded soundtracks were invented in 1929. Sunday, May 23, 3:00 p.m.
World renowned organist James David Christie will performs J.S. Bach’s final work, Die Kunst der Fuge (The Art of the Fugue), BWV 1080. Organist Jacob Street (Oberlin Conservatory) will join Maestro Christie for the four handed “Mirror” movement. All proceeds will go towards the maintenance of this renowned mechanical-action organ. Tax receipts available for donations over $20. Monday, May 24, 12:15-1:00 p.m.
Every year ORGANIX presents concerts by advanced organ students from nearby universities. Today’s concert features Jacob Street from Oberlin Conservatory (Ohio). Saturday, May 29, 10:00 to 3:00 p.m. The Open Doors program lets the public visit architecturally interesting and/or historical buildings. While visiting Holy Trinity (built 1847), come over to the pipe organ for a demo or even play it yourself. Someone will be on hand to answer questions and help you out. Sunday, May 30, 7:00 p.m.
Italian virtuoso organist Eugenio Fagiani will perform original compositions, transcriptions and improvise on themes submitted by you, the audience. Monday, May 31, 12:15-1:00 p.m.
Our final concert features beautiful repertoire for organ and harp including a concerto by G.F. Handel and Grandjany’s Piece in Classical Style.